Coconut Day…I mean Valentine’s Day…Special — Lemongrass Coconut Chicken Stir Fry, and Chocolate Coconut Cupcakes, with a Twist! I recently discovered the wonders of lemongrass paired with coconut milk. My husband and I were eating dinner at a local restaurant, and we sampled a delicious carrot lemongrass coconut soup. The chef was kind enough to give me the recipe. It was yummy! That inspired me to buy fresh lemongrass again. On Valentine’s Day, I wanted to cook something different. I had a hankering for coconut and chocolate. I think for those of us who don’t eat dairy very often, sometimes the body craves fat of some other kind! And what’s a Valentine’s Day without a little chocolate. I also had some chicken tenders in the fridge that needed to be cooked. And I had a can of coconut milk, and some shredded coconut. So I googled vegan coconut cake, and found this recipe for coconut chocolate cupcakes. I paired it with another recipe for coconut frosting, and then added my own twist by putting toasted coconut on top of the frosting (see how to toast coconut below). Wow! These were awesome! Very dense, sweet, but not too sweet, cupcakes, with absolutely yummy frosting! A big hit. I also googled lemongrass chicken, and found this recipe. Since I didn’t have all of the ingredients in my fridge, I put my own twist on it, and came up with the recipe below. I added lots of veggies and the coconut milk that I didn’t use when I made the cupcakes and frosting, to make an absolutely delicious lemongrass coconut chicken stir fry. My husband loved it! It’s definitely going to be added to the rotation! In a medium sized bowl, mix the ingredients for the chicken marinade, and then add the chicken tenders. Make sure the tenders are covered with the marinade, and let the chicken rest in the marinade for one to two hours (refrigerate if hot in your kitchen). While the chicken is marinating, chop your vegetables for the stir fry. 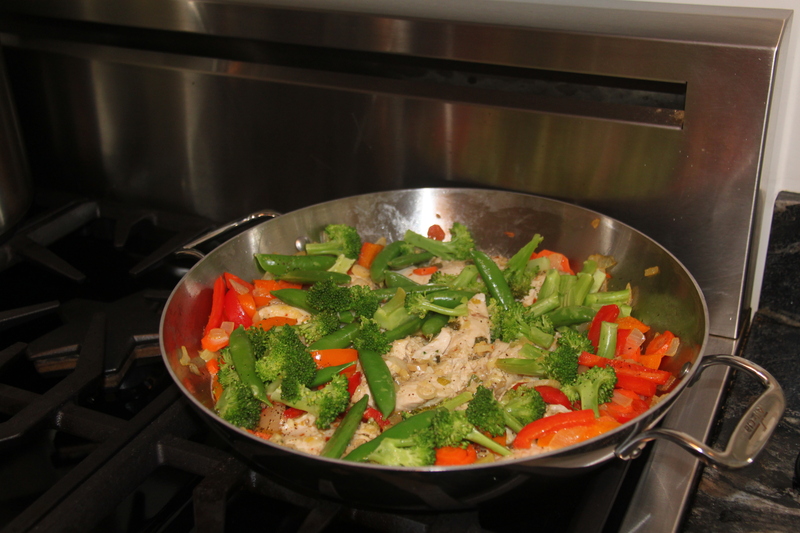 When the chicken is ready, heat enough olive oil to thinly cover a stir fry pan, on medium heat. Add onions, red peppers, and orange peppers. When those have almost cooked through, add carrots and celery. Cook for another 1 to 3 minutes. Make room in center of pan and place chicken tenders on bottom of pan, slathering marinade on them that remains in the bowl. Make sure to use all of that marinade — it’s so good! When chicken tenders begin to cook on the side that is down, turn them over. When the bottom side looks as though it has started to cook, place broccoli florets and snap peas on top of chicken. Add coconut milk around the perimeter of the vegetables in the pan. Season with sea salt and ground black pepper to taste. Place cover on stir fry pan and continue to cook for 3 to 5 minutes. By placing the cover on top, the vegetables steam so that they are still slightly crispy when finished, and the chicken finishes cooking. Remove cover and make sure chicken is cooked through. Serve over your favorite rice (I used organic brown rice). I also squeezed 1 lime wedge over each serving, and then sprinkled each with toasted coconut before serving. (P.S. — just watched a great video on the NYT website in which Melissa Clark explained how to cook with lemongrass in a stir fry. Cut off base; cut off stringy end; peel like a scallion; then bruise remainder with rolling pin or meat pounder; then mince. Check out the Melissa Clark video). (P.S. — to toast the coconut, I followed the instructions on a package of shredded coconut — spreading it on a cookie sheet and then cooking it at 350 in the oven for 3-5 minutes).